The 845, the industry’s price/performance leader, puts tab-quality calibration and high-performance thermometry in the palm of your hand. Providing 0.5°F accuracy for base metal thermocouple types and 1.7°F accuracy for high temperature thermocouple types and full range resolution of 0.1° in F and C, these instruments are superior for simulating and reading temperatures. Big, “One-Touch” keys let you quickly program every function for both calibrator and thermometer. Use the keypad to select TC types (up to 11 on some models). RTD and Ohms functions, calibrator or thermometer mode, 8F or °C, view 10 memory locations or hold the thermometer reading. The big, bright 5-digit LCD shows all active functions and there are no dials, switches or ramp keyboards to contend with. 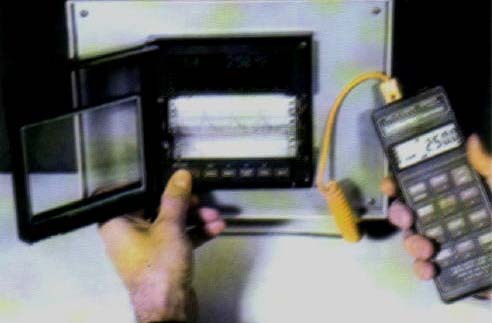 Calibrator set points can be programmed from an outside source through the thermometer memory mode or direct via the calculator-style keypad. A step function allows one touch output of programmed values, and when turned off, the units retain last-programmed values for quick repeat use. The thermometer mode provides accurate, dependable readings. Ten memory locations let you store temperature measurements for later review. Direct keypad selection of 11 most common TC types. NIST Traceable Certificate of Calibration from Manufacturer. Shirt pocket size drop-proof, splash-proof and dust-proof case. ACCESSORIES SUPPLIED: NIST traceable certification form manufacturer, universal calibration adapter & cable, integral tilt stand/hangar, wrist strap, 9V battery, and manual. DISPLAY: 5-digit LCD 0.4" height and decimal point. DIMENSIONS: 7.0" x 2.9" x 1.1". Net Weight 12 oz.